☛What is a breathing resistance training mask? ✍The air intake amount is determined by different intake valves, and the different intake air amounts correspond to the air thinness at different altitudes. Through this way you can achieve simulated altitude training or enhance the function of the respiratory muscles. ✍By limiting the volume of air entering the mask to limit the volume of oxygen, you can increase the intensity of training and enhance personal strength by wearing the mask. ✍Better improve your muscle strength, help to burn fat, and increase basal metabolic rate. ✍Mainly trained in muscle endurance in an anaerobic state. Increase explosive power. ✍Enhance cardiopulmonary function and endurance. 1.【Six Resistance Levels】- Train from novice to expert with the simple turn of lever! 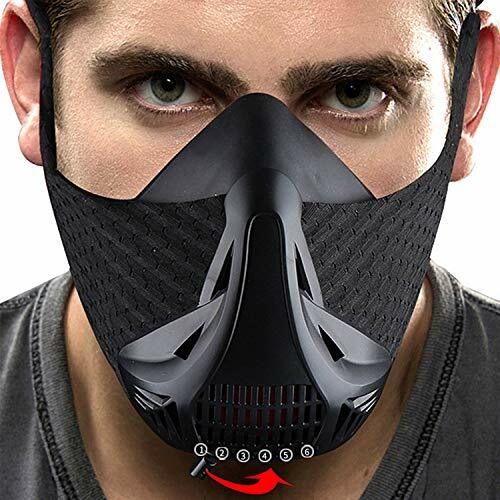 Each one of our resistance levels simulates an entirely unique altitude and workout experience from 1600 ft all the way to 19000 ft. With this training mask, you will definitely breathe more effectively and get more stamina. 2.【Enhance Endurance】Steadily improve your lung capacity through pulmonary resistance. Our mask strengthens your diaphragm and breathing muscles, which accelerates your training to the next level. 3.【Soft material】Made of food grade silicone, breathable elastic cotton fiber, fits your face tightly. And the back side use velcro fixed, not easy to fall off. 4.【Versatile Training Mask】- This Premium Training Mask fits almost any sports activity which you like. Used for Running, Football, Basketball, Rugby, Cross fit, Jogging, Gym, Biking, Skiing, Hiking, Marathon, Triathlon or any other sport you want to improve your efficiency. Spike up your athletic potential! 5.【Good Service】If you are not satisfied with this mask or feel it doesn't fit you, please send it back to us, then we will give you a full refund. Any questions please contact us first, we will give you a best solution.